THE BOOK: My Brooklyn Writer Friend. THE PUBLISHER: Queens Ferry Review. SUMMARY: Gloriously meta, My Brooklyn Writer Friend ventures inside the many minds of the writer. 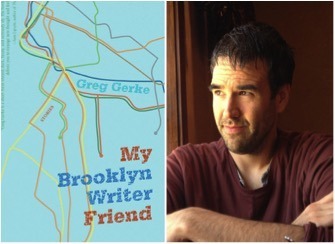 Laying bare the struggle with beginnings, the trouble with endings, and every hard-earned narrative step in between, Greg Gerke appreciates that whether writing into truth or lie, what matters is character. Neurotic and funny, earnest and obscure, the voices that echo in these short short stories resound with a clarion honesty that remains—and provokes and teases and endears—long after the final page is turned. And so, I will only act as a literary biographer with no hope of heaping criticism onto this distant enterprise and will try to map the book’s coordinates. With a few exceptions, all of the stories after the first section were written within some weeks of each other, during a very grueling winter just after I moved back to Brooklyn six years ago. I remember sitting on a bench in Prospect Park, looking at its Long Meadow covered in snow and ice, and writing some stories in longhand while gloved. Surprisingly, amidst the chill, a man crunched through the park’s icy walkways and sat next to me (there is only one bench facing west on the meadow proper) without comment—out of deference for my act or in awe of the failing puce sun about to be eclipsed by a large tower on Prospect Park West. On another occasion, I couchsurfed in Bed-Stuy. Did that engender the story “My Bed-Stuy Friend”? Possibly, though I awoke another morning there, after attending a literary event in Soho that may have filled me with envy, despair, and anomie, and I scribbled “My Brooklyn Writer Friend.” But I have always seesawed while living in New York, usually writing away from my residence, often in the fusty Mid-Manhattan library on 40th and 5th—a kitten of a building, though six floors high, compared to the lionized behemoth kitty-corner to the kitten, the Steven A. Schwartzman building, as only librarians and those fusspots into the proper name thing call it. Much of my output has gone on in this decaying structure that I chose over its Big Daddy for the simple fact of being able to walk the stacks and peruse any book I fancied. It retains a colorful cast of characters, perspicacious librarians, as well as the homeless, who ofttimes line up eighty deep before opening to be the first in, and various older men who go to their self-appointed floors, and sometimes chairs, and open the volumes accompanying them like so many children. This motley crew includes a dapper Japanese gentleman I have seen on and off for ten years and who just last Tuesday refused to acknowledge my stare at the incredible coiffure that is his hairstyle, with a side part and bangs jutting out like freestanding sculpture. In those years, I too assigned myself the third floor because of its proximity to the Belle-Lettres sections, which I often needed for reference and recharge, including Elizabeth Bishops’s Poems: North & South. A Cold Spring first edition, an object holding a poem that forced its way into a story, the way the weed in her eponymous poem, “lift[s] its head all dripping wet/…/ and answered then: ’I grow,’ it said,/’but to divide your heart again.’” Sitting on the wooden chairs, many stories came to light with the awful silent whine of fluorescence overhead, accompanied by the too loud cell-phone conversation or a person yelling at unseen others. Many were written in between bouts of sending out job applications and worrying where I would live, sometimes not knowing where I would sleep at night. It was a frantic time. I spent five days of the Christmas week stuck in the Upper East Side bed of my friend’s parents (they were all in the Hamptons) with the second worst flu of my life, having to ask my Harlem friend to buy and bring panaceas galore. Then a month’s sublet in Bushwick, home to the most bedbugs per capita, though luckily only small cockroaches crawled about my bed at night in a windowless room. In the midst of this, I went to interview Paula Fox at her semi-palatial house in Brooklyn Heights. I dated a documentarian, but she didn’t make jokes and didn’t get mine. Plus, a few weeks were spent in a second floor apartment off of one of the Lower East Side’s noisiest intersections, Ave. A and 4th, listening for hours to the debaucheries of the new jet set through a thin pane of glass. But it was a glorious time because the muse had pointed her finger and bade me write. I would have never made it through but for the kindness of friends. WHY WOULD SOMEONE WANT TO READ IT? Electric Literature said, “[t]he thirty-eight stories contained in this collection pendulum deftly between the comic and the heartbreaking.”– Brooklyn Rail Review. AUTHOR PROFILE: Born in Milwaukee, Wisconsin, I studied film at the University of Wisconsin-Milwaukee before moving to Eugene, Oregon and getting an English degree. I lived in Germany and France for a year and a half between 2001 and 2002, and have been living in Brooklyn since 2005, primarily doing homeless outreach work for a city organization. I curated a reading series in Brooklyn called the Soda Series, featuring many acclaimed and emerging authors, and I have interviewed a number of writers, including William H. Gass, Lydia Davis, Paula Fox, and John Jeremiah Sullivan. My fiction and non-fiction have appeared in Tin House, The Kenyon Review Online, LA Review of Books, Denver Quarterly, Quarterly West , Mississippi Review, LIT, Film Quarterly, and others. I have published two short fiction collections: My Brooklyn Writer Friend in 2015 from Queens Ferry Press and There’s Something Wrong with Sven in 2009 from BlazeVox. SAMPLE CHAPTER: Two stories at The Collagist. PRICE: $8.48 as of now.